B2B and B2C Marketing are Dead. Long Live B2H! Today more thank ever, buyers want a human experience from the brands and businesses they buy from. This is true of both the business-to-business (B2B) and business-to-consumer (B2C) environments. I read with interest a recent B2B Magazine interview with Rick Segal, Chief Practice Officer at the B2B agency gyro. 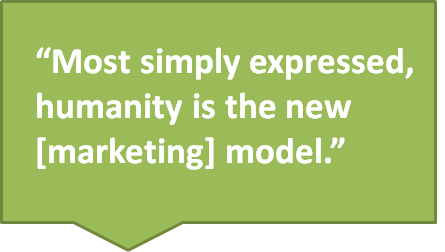 In it Segal (who said that B2B marketing was dead in 2010) talks about how the new model of marketing involves engaging with individuals on a very human level. I agree. 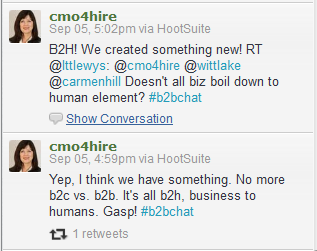 We’ve talked about this in the weekly B2B Marketing Twitter chat (#B2Bchat). I think this has always been true for those who knew enough to leverage relationships in business. Some of the most successful sales, marketing and business people fostered great relationships with customers and colleagues. But now more than ever technology and social media are bringing opportunities for marketers to be in all business transactions. Buyers are giving us tremendous opportunities to connect with them, but they don’t want a two-dimensional, transactional relationship only. They want interesting and human! I think this is most difficult for many of my clients, who provide technology products and services. To the inventor or engineer, the product or service is the story! It should sell itself on features and benefits alone! But people buy from people they like. And now in the boundary-less, virtual marketing world of the Internet, with hundreds, thousands, maybe millions of options, it will be the businesses that engage at the interesting and human level to market their great product or service that get and keep the attention of buyers. 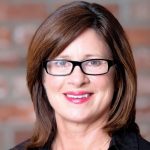 If you need help building marketing programs and campaigns that attract and engage buyers online, contact Jennifer Beever at New Incite today. We provide consulting, strategic analysis and planning, and marketing implementation or execution to get results for our clients.